Sound the alarm, the Storm Code Black is ready for launch. The Code Black uses Storm's famous RAD (Radial Accelerating Disk) technology. This tech has been used for many years, in balls such as the X-Factor and Lock, and is still changing the game. The newest incarnation, RAD4 Asymmetric core, is designed to generate torque unlike any other core. This increases differential, flare and backend motion. Pair this with the proven R2S Pearl coverstock and you'll see the strongest skid/flip reaction you've ever achieved. 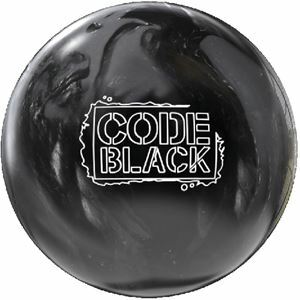 The Code Black will be able to create angles that most bowlers aren't able to create. Radial Accelerating Disk technology dates back several generations with hints of it that can be found in the RAD4 Core. It features an extremely dense modified disc shape that generates substantial torque.